I recently spent several days helping to choose the UK IWC Wine Merchants of the Year, a process that, I can confirm, was scrupulously run and involved a set of very impressive judges (myself excluded obviously). Among the criteria we considered was the quality and breadth of range offered by each of the companies. None, I can reveal, proposed just 40 reds, whites, pinks and fizzes as 10 Green Bottles does to its customers. Nor can I say what the other judges would have made of such a limited range, but I think it would be fair to say that proposing fewer than a dozen wines of any colour is probably not calculated to win you many prizes. It certainly wouldn’t have curried much favour with the people who have just come up with the Wine Spectator list of best restaurant wine lists. Two thousand seems to be the kind of number of different bottles they are looking for. But what if 10 – or maybe 100 – Green Bottles were right? What if offering an all-embracing, comprehensive selection of wines from every corner of the planet is not actually the best thing to do? In 2000 Sheena Iyengar and Mark Lepper published a now-famous paper in the Journal of Personality and Social Psychology that described three pieces of research showing that consumers buy more if they are presented with a smaller number of items to choose from. When customers in a US grocery store were offered six different Tiptree jams, 40% stopped to taste, of whom 30% went on to make a purchase. Compare this sales figure with what happened when the range of jams was expanded to 24. Now 60% of the customers were tempted to sample – 50% more – but only 3% actually bought anything. So, if you extrapolated this to 1,000 people, offering a wide choice would yield sales of just 18 jars of jam, compared to the 120 you’d sell from the smaller selection. There have, admittedly, been a few retorts to the Iyengar/Lepper thesis, but it has stood the test of time pretty well and a trawl through the internet throws up large numbers of anecdotal support for it from shop assistants with no academic qualifications, or axes to grind. Among the academics who agree that a wide choice may be counter-productive is Mike Veseth, the brilliant self-styled wine economist. In 2010, In a 2010 blog post called “the Paradox of Wine Choice“, Veseth says “greater choice first delights us, then overwhelms us, then it can sometimes drive us crazy. There must be a ‘best’ among all the rest. Which is it? And how will I know? The quest for the best can sometimes destroy the pleasure of the very good by introducing an unwanted but unshakeable sense of doubt”. He goes on to say that this is the “Age of Anxiety for wine” and that “some of the hottest products in the wine market [such as Barefoot] seem to simplify wine just a bit and perhaps unitentionally address this anxiety”. The title of Veseth’s post refers to a book called Paradox of Choice by Barry Schwarz, in which the author describes as “maximizers”, people who “seek and accept only the best”. These perfectionists are contrasted with “satisficers” (an ugly term, I agree) who “settle for something that is good enough without worrying about the possibility that there might be something better”. Schwarz and Harvard psychology professor Daniel Gilbert in Stumbling on Happiness convincingly suggest that satisficers are actually often happier with their lives than maximizers. Which brings us back to the ideal number of wines for any retailer to offer. UK chains have put between 500-1500 wines on their shelves in recent years, and often been rewarded by having to dispose of large numbers of unsold bottles. The Long Tail may apply to music downloads or books which can be stored in warehouses until someone wants to buy them, but it does not apply to those cases of 2010 pink or white wine that failed to find homes. Costco, which sells over $1bn of wine every year has a vast list of wines on its “approved” list, but stores are allowed to choose what they want to stock, based on available space and consumer demand. Between a hundred and two hundred wines often seems to be a workable number. That’s admittedly broader than 10 Green Bottles’ 40-strong list, but in some cases only three or four times as broad. Curiously, my friends who applaud extensive wine ranges rarely seem to complain about the growing trend among restaurants to restrict choice. The headline of a recent piece by Richard Godwin in the London Standard, says it all:“Short orders… why the hottest restaurants don’t have choice on the menu.” Maybe 10 Green Bottles has something to teach the rest of us. You might have added that Aldi & Lidl have a limited range (70-ish?) and have managed to grab a chunk of the wine market. Supect it's not just price based. Other research shows most people tend to select in a matter of seconds so aren't interested in the long tail, as it complicates and slows the process. Good article. May I be so bold as to suggest that incredibly long wine lists show a couple of things: sommeliers have inherited legions of wines from previous sommeliers all with different tastes, generally accumulated before money was an issue for those likely to eat in such establishments; also, some sommeliers are swayed by whoever is in front of them at the time and purchase the entire range of a a certain producer's wines; or buy established 'must have icons' rather than seeking more interesting wines from lesser known regions and seeking to source wines that go best with the food offered. 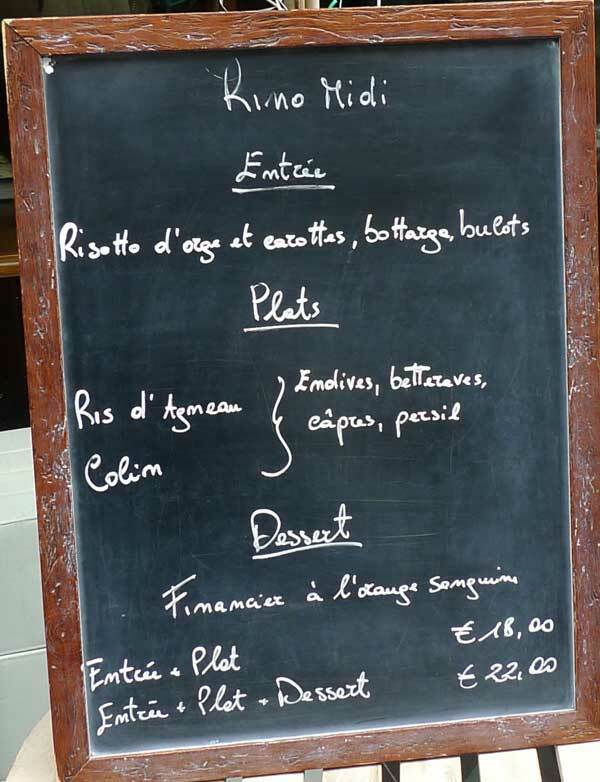 Precise, well chosen food menus are the readily accepted norm, so why not wine? We argued quite strongly, on the The BBC Food Programme, that supermarkets were actually failing wine customers by offering so much choice. They select and offer us three chickens – but three hundred wines. Surely part of a retailers duty is to select items for their customers, not simply shovel volume in front of them? No sooner had this broadcast gone out, than Anthony Rose in the Indy was criticising us. “What's wrong with choice?” he asked. Well, nothing – but perhaps, from the basis of their supposed knowledge, retailers could exercise a little more on our behalf. Thanks for responding. I heard – and liked – your contribution to the Food Prog. But – playing devil's advocate – of course you could say the same about bookshops. Do we really like ones with limited ranges of books? From @Babelwineparadox of choice – Don't know if you've seen this? Very good! Quite ironic how France is the capital of the set menu, whilst concurrently Championing the increasing fragmentation of the wine offer. In any respect, logic dictates that as you become smaller (ie. with respect to competitors in the market), you are harder to find.